Take a journey to the end of the world at one of these three sustainable getaways. At Eco-Hotel Spa Yves Rocher, in the heart of France’s Brittany region, you’re definitely in five-star-hippie territory. Everything about the place, including the chic treehouse, is about immersing you in a sensual experience with nature. Let’s start with the food. The restaurant, Les Jardins Sauvages, serves organic meals made from ingredients grown by local gardeners, bakers, craftsmen and apiarists, all within 20 or so miles from the hotel. Every June, they host the Festival Photo La Gacilly, the largest outdoor photo festival in France, which focuses on nature. The 20 rooms have grass roofs to bring in direct sunlight and limit heat loss in winter, and have southern exposure’to optimize natural light. The two-person treehouse suite called The Cabane is nestled in a 200-year-old cypress tree with views over the kitchen garden and a woodland park. It’s the perfect place to weather the apocalypse. 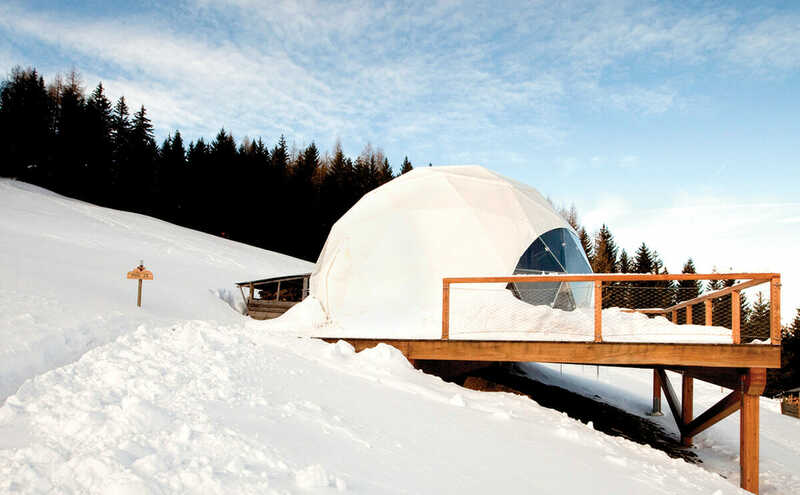 Before you build your new off-grid yurt home, you can test drive one at the eco-luxury Whitepod escape in the Swiss Alps, roughly an hour-and-a-half drive from Geneva. This is off-grid-vacationing-meets-summer-camp at its most comfortable and in all seasons. With full showers and baths, the 15 geodesic tented pods are heated by a wood-pellet stove. Water is pumped directly from a nearby fresh water source. There is electricity. Nearby Malatray farm delivers fresh cheese and cold cuts, and local winemakers come for weekly tastings. Activities here are all about hiking, with or without dogs. We recommend doing strenuous mountain activities in order to build up an appetite for the delicious local food at the mountainside restaurant, Les Cerniers. On an isolated island in the Seychelles off of Africa, you can live the ultimate barefoot eco-luxury life. North Island is a private island and nature sanctuary that went to ruin after the collapse of the coconut industry in the ’70s, but has been built back up by prominent ecologists over the last decades. They have not only renovated the island inn and spa, but have restored the indigenous flora, fauna and reintroduced lost species, too. Drink fresh-from-the-tree coconut water, hang out with turtles and rare indigenous birds like the Seychelles magpie-robin, and sleep in one of 11 architecturally thoughtful and sustainable cabins constructed with felled trees and stones by local craftsmen. Robinson Crusoe wannabes, this is your place. Photographs courtesy Frank Bel (Eco-Hotel); Anthony Grote (North Island).